Braxton Bragg was educated at West Point and served as an Army officer in the Mexican-American War. He retired from the U.S. Army in 1856 and moved to Louisiana to become a sugar plantation owner. When the Civil War broke out, he joined the Confederate Army and trained troops in the Gulf Coast area. He was a corps commander at the Battle of Shiloh and fought a series of losing battles in the Western Theater but won a decisive but bloody battle at Chickamauga. Later he was defeated at the Battle of Chattanooga and removed from command of active forces. He then served as a military adviser to Jefferson Davis. In the years after the war, Bragg worked as superintendent of the New Orleans waterworks, adviser of harbor improvements and as a railroad inspector and engineer. 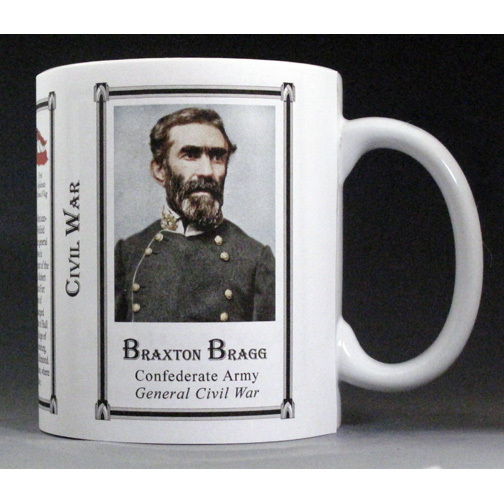 This Braxton Bragg mug is part of our Civil War series profiling participants in the War Between the States. Thousands of Confederate and Union soldiers fought in battles such as Bull Run, Antietam, Fredericksburg, Chancellorsville, Gettysburg, Vicksburg, Chattanooga, Cold Harbor and Petersburg. We honor their sacrifices by telling their stories. 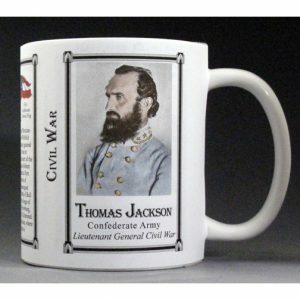 This Richard Lucian Page mug is part of our collection of Civil War biographical mugs. An image of Richard Lucian Page and a short biography are features of this history mug. 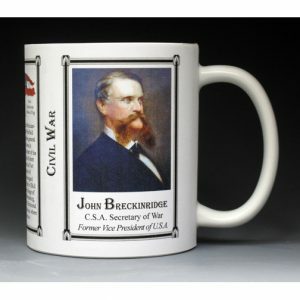 This John Hunt Morgan mug is part of our collection of Civil War biographical mugs. 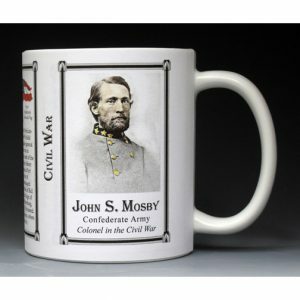 An image of John Hunt Morgan and a short biography are features of this history mug. 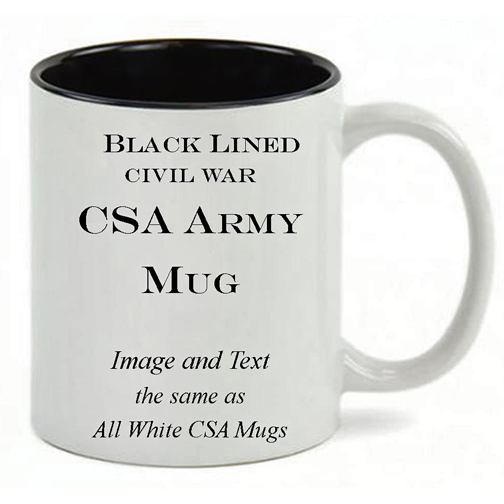 This William Quantrill mug is part of our collection of Civil War biographical mugs. An image of William Quantrill and a short biography are features of this history mug.